Bristol Rovers' 94-year stay in the Football League came to an end after they lost against Mansfield. The Pirates needed a draw at home to the Stags but found themselves behind after Colin Daniel volleyed in off the post in the 36th minute. The home side knew they needed a goal, but saw three efforts hit the crossbar. And their relegation to the Conference Premier on goal difference was confirmed after Northampton and Wycombe won their final-day games. The match concluded to chorus of boos and a section of fans entered the pitch to express their anger at Rovers' drop to non-league football. The Pirates' fate was in their own hands after their 2-1 win last Saturday against fellow strugglers Wycombe, who occupied the final relegation spot at the start of the afternoon. Rovers started brightly enough, but the 10,000 home fans were stunned into silence in the 36th minute when Daniel placed a low volley past Steve Mildenhall, which bounced in off the woodwork. Eleventh-placed Mansfield, who were promoted from non-league last year, defended resolutely throughout to stop Rovers finding that important goal. Goalkeeper Lewis Price pulled off two acrobatic saves to deny David Clarkson in the second half, while top scorer John-Joe O'Toole headed agonisingly wide of the post. And as the tension mounted around the ground with 15 minutes to go, captain Mark McCrystal also lashed a volley just over the crossbar. With five minutes of added time, Mansfield kept hold of possession as the Pirates ran out of ideas. 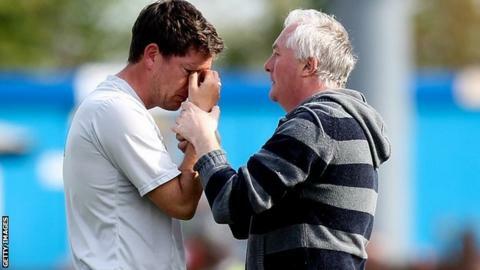 Initially there was silence around the Memorial Stadium as the whistle blew, before some disgruntled Rovers supporters jeered the players and manager Darrell Clarke off the field. A section of fans then broke out of the stands - some running towards the away supporters and some aiming their anger towards the boardroom - before mounted police ushered them back. "It's hard to see a big football club relegated from the league. "We had to come and be professional and look after our own camp. We finished in 11th so it's been a decent season. "I'm proud of the football club and I think we deserved the win today." Match ends, Bristol Rovers 0, Mansfield Town 1. Second Half ends, Bristol Rovers 0, Mansfield Town 1. Attempt saved. Samuel Clucas (Mansfield Town) right footed shot from outside the box is saved in the bottom left corner. Corner, Mansfield Town. Conceded by John-Joe O'Toole. Substitution, Mansfield Town. Lindon Meikle replaces Colin Daniel. Louis Briscoe (Mansfield Town) wins a free kick in the attacking half. Mark McChrystal (Bristol Rovers) hits the left post with a left footed shot from the left side of the box. Corner, Bristol Rovers. Conceded by Liam Marsden. Attempt missed. Tom Parkes (Bristol Rovers) header from the centre of the box is just a bit too high. Corner, Bristol Rovers. Conceded by James Jennings. John-Joe O'Toole (Bristol Rovers) wins a free kick on the left wing. Foul by Colin Daniel (Mansfield Town). Foul by David Clarkson (Bristol Rovers). Attempt missed. John-Joe O'Toole (Bristol Rovers) header from the centre of the box is close, but misses to the left. Attempt missed. Kaid Mohamed (Bristol Rovers) right footed shot from the centre of the box is just a bit too high. Substitution, Mansfield Town. Ross Dyer replaces Ollie Palmer. Attempt missed. David Clarkson (Bristol Rovers) right footed shot from outside the box is close, but misses to the right from a direct free kick. Matt Harrold (Bristol Rovers) wins a free kick in the defensive half. Attempt saved. Fabian Broghammer (Bristol Rovers) right footed shot from the left side of the box is saved in the top centre of the goal. James Jennings (Mansfield Town) wins a free kick on the right wing. John-Joe O'Toole (Bristol Rovers) is shown the yellow card. Attempt missed. David Clarkson (Bristol Rovers) header from the centre of the box is just a bit too high. Substitution, Bristol Rovers. Alefe Santos replaces Seanan Clucas. Attempt blocked. Kaid Mohamed (Bristol Rovers) right footed shot from outside the box is blocked. Kaid Mohamed (Bristol Rovers) wins a free kick in the attacking half. Attempt missed. John-Joe O'Toole (Bristol Rovers) left footed shot from outside the box is close, but misses to the right. Attempt saved. Ritchie Sutton (Mansfield Town) header from the centre of the box is saved in the top centre of the goal. Corner, Mansfield Town. Conceded by Tom Parkes.